Happy Friday! I hope everyone has some relaxing weekend plans on the radar. 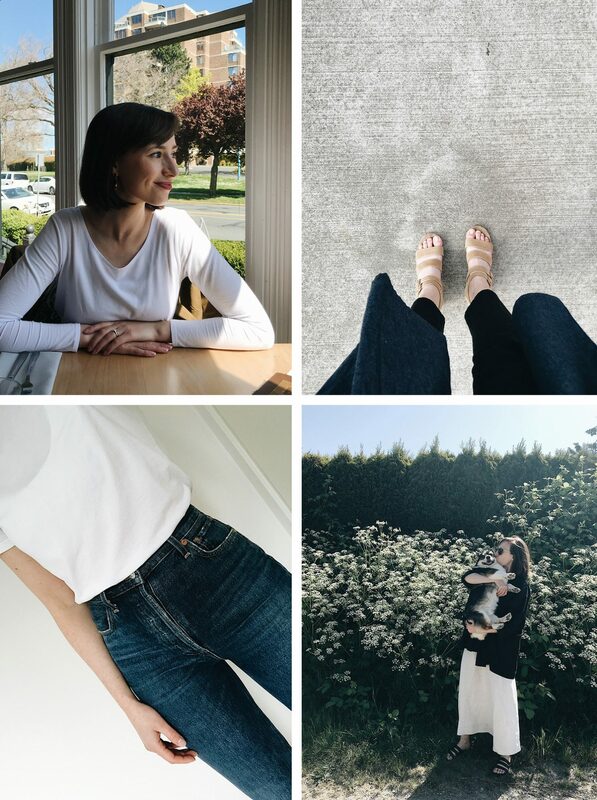 This week I finally had time to review a Closet Mission exercise I completed during our time in Vancouver, that is, my West Coast Wear Count! You might recall Part 1, which I shared at the end of March but if not, you can check that out first if you’d like to learn why I decided to try it out and why I opted for an analogue approach. Essentially, this ‘wear count’ idea has been about answering one of my 2018 Closet Mission goals, which was to: Develop a better system for closet analysis. Until now, I’d found it hard to put real numbers to my outfit and wardrobe performance so I decided to start keeping track of how often I’ve been wearing the core items in my closet in order to gather some real data and today the final numbers are in! My final West Coast Wear Count. My 15 most worn Spring pieces. Plus, all the outfits I managed to capture. Let’s dig in shall we? 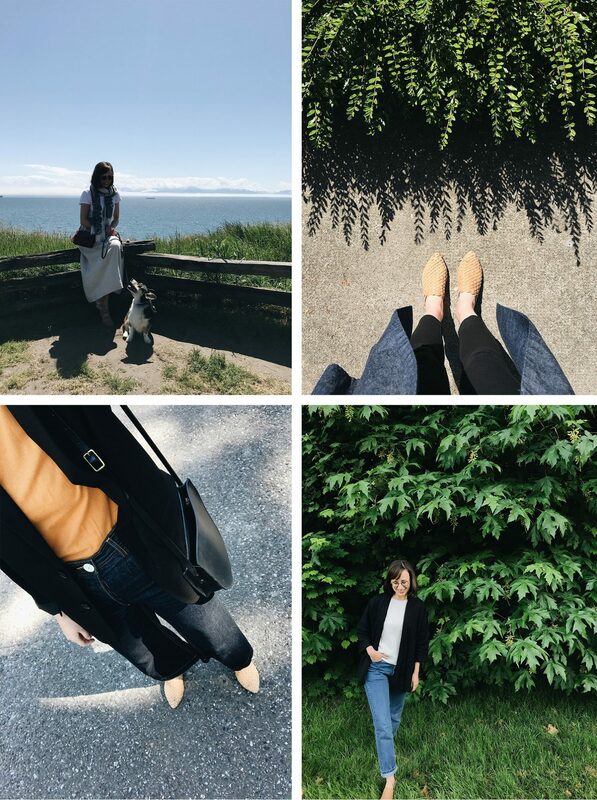 Here’s a look at the not one, not two but three page list of what I wore while out west! Full disclosure, I did not keep it this neat and tidy for 3 months so I re-wrote the list for aesthetic purposes but the numbers are no lie! You might have noticed at the top of my wear count list there is a section of 12 items in a box. Those were winter or colder weather items that I packed away for the warmer half of our stay. I noticed I wasn’t really adding any more ticks to those ones so I set them aside and decided to focus on the pieces I was wearing for spring weather and below you’ll see those 15 items, although there are still a number of cross overs. While there were a few additional items that qualified for the top 15 list, I only included the ones that really stood out as key players in my style overall (ie: I left out my hiking boots). STRIPED TEE* | 12 | Brought with me | I had two striped long sleeve tees with me on this trip (one by Amour Vert and one by Emerson Fry). I counted them as 1 item and found that they were in rotation almost weekly until it got really hot. A semi-fitted long sleeve with a high neckline and a bold but classic pattern is definitely an ideal layering piece for me. 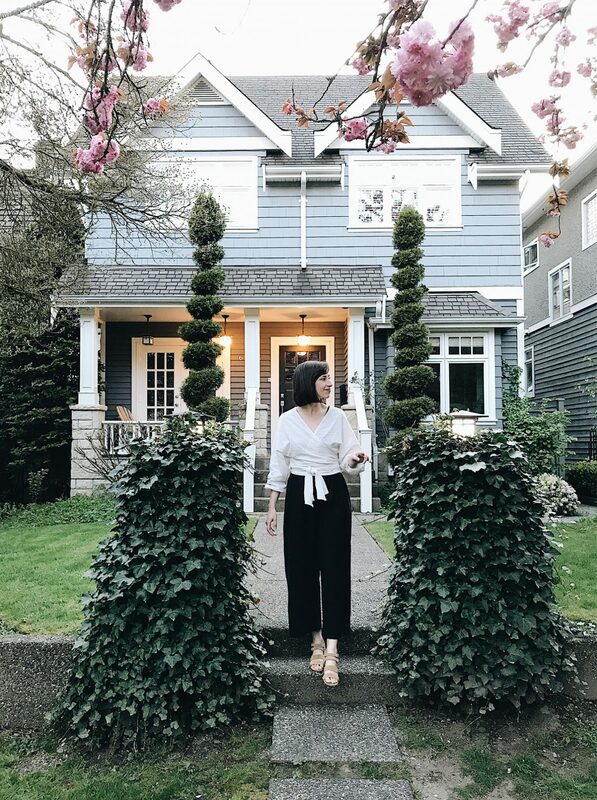 FLORENCE SILK PANT | 12 | Brought with me | These pants have been a favourite in my closet since the day that they arrived! They are just as comfy as a sweat pant but much more presentable for real life. I also found them extremely forgiving when it came to creases and needed to be washed or ironed. Keeping them hung up meant that any wrinkles would fall out over night and they’d be as good as new by the next time I wanted to pull them on. Similar available here by Eileen Fisher on sale! PARIS WOVEN MULE | 20 | Added | I bought these mules while we were out west and I’m so glad I did! You can read my full review on them here. 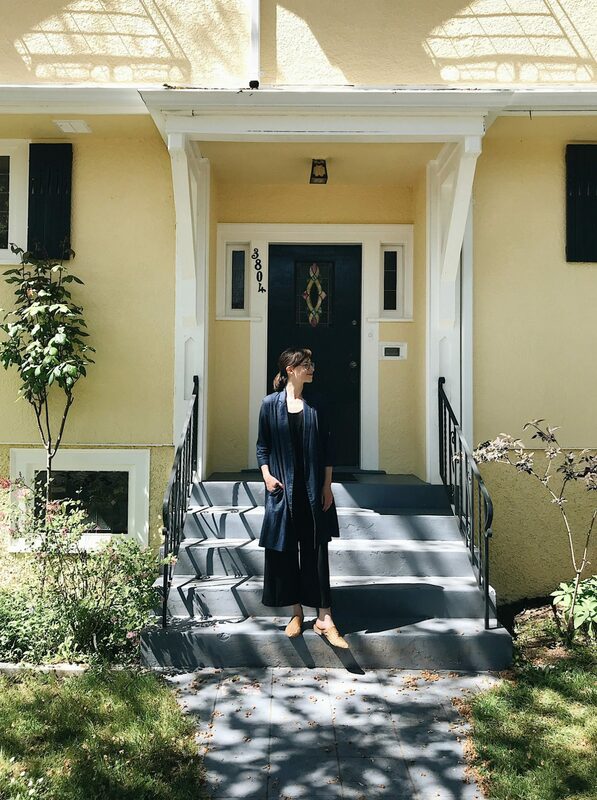 They ended up being the perfect option for exploring and going about my day-to-day life in a shoe that was every bit as comfortable as it is stylish. RAIN COATS* | 26 | Brought with me | It will come as no surprise that my rain coat(s) got a lot of use in Vancouver. I had both a lightweight option and a heavier rubber option and they both came in handy for different temperatures so I’ve included them as one item here. It’s safe to say that life on the west coast without a rain coat would be pretty miserable! WHITE BODYSUIT | 17 | Brought with me | A white ribbed bodysuit with vintage jeans and a jacket was essentially my uniform for the latter half of the trip. I have the Sophie, Simone and Lana styles from The Bodysuit and cannot recommend them enough! Looks like they’ll be restocking soon. BLACK BLAZER | 10 | Brought with me | I adore this piece in my closet and always reached for it when I was heading out for a dinner or going to a meeting and needed an extra layer but wanted a little structure. It’s perfect over a striped tee or bodysuit with jeans and a cute heel! HARPER JACKET | 13 | Added | This was another addition I made to my closet and a major player in my Spring style this year. I love how it instantly transforms a simple base (like a white tee and black pants) into an elevated, chic as hell look. I lost track of how many people asked me about this jacket but it’s definitely a stand out item. BLACK JEANS | 15 | Brought with me | Of course black jeans are a no brainer. I wore my boyfriend jeans a lot because they’re just so flattering and easy to throw on with a simple top and my Paris Mules. BUTTON DOWNS | 9 | Brought with me | Technically I wore my Philosopher shirt (black version) more than the Friend (ivory) but I sort of count them as interchangeable because they go with all the same items. I love how versatile and easy these shirts are to wear. They were the perfect bridge piece to take my style from spring to summer. *Linked to a similar option. VINTAGE JEANS* | 11 | Added | I found this pair of Levi’s at the cutest little shop called Hey Jude in Gastown. I always try on vintage Levi’s when I get the chance but try to keep my expectations low. I’ve probably tried on 100 pairs for every pair I’ve ended up buying but that makes the ones that do finally fit all the more special. These are similar to my Riley Crop jean but have a slightly lower rise, more relaxed fit through the leg and a slightly longer inseam. Essentially the 501’s of my dreams. 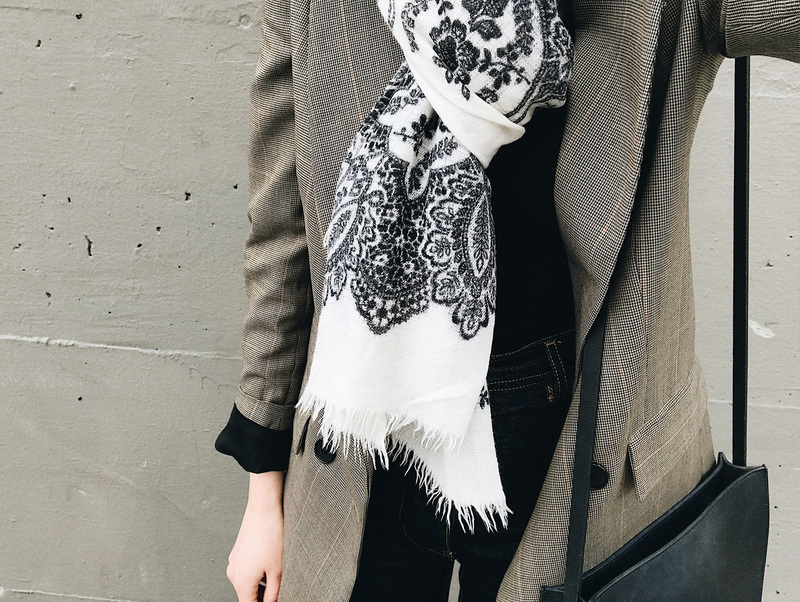 LINEN BLAZER* | 9 | Brought with me | This was a favourite piece from last summer and it was a great option for the weather in Vancouver this spring. I loved it with my Cecilia Pant and a silk tank or fitted tee and some cute shoes. HDH TENCEL JUMPER | 9 | Added | I added this jumper for a collaboration with Hackwith Design (see it here) and it’s honestly become a closet hero. It is the piece I reach for whenever I want to dress up but not look ‘dressed up’ or feel stylish without sacrificing comfort. It’s great layered over something fitted or worn under a cropped sweater or blazer. It came with me to Europe and it’s in my bag for a bachelorette trip this weekend. I’ve yet to find an occasion I wouldn’t wear it for! RAIN BOOT | 24+ | Brought with me | Another no surprise here. I actually stopped adding ticks to this line because they were clearly a closet hero item! CLYDE JACKET | Added | I wasn’t sure how much I’d wear this since I had quite a few jacket options but I ended up reaching for it a lot. Once the weather warmed up my wool Cardiff was too hot so this one became my go-to for morning walks with Dobby and chilly evenings on the patio. BEL SKIRT | Added | I can’t tell you how glad I am to have added this skirt as part of my Spring 10×10 Collaboration with Elizabeth Suzann (same as the Clyde Jacket). It’s been such a go-to for me whenever it’s been hot or I’ve wanted to switch it up from my Florence Pants. Love it over a bodysuit, fitted tee or with a linen shirt knotted in front. Overall, the exercise was really useful and helped me better assess the choices I made for my time out west. 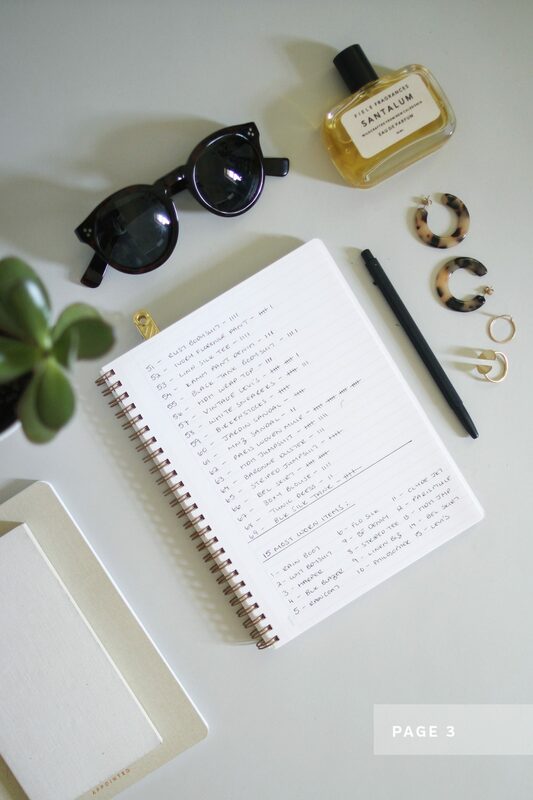 Of course, there were times when I forgot about the list for a few days, one or two items might have been missed and I’m sure I forgot to tick off every single wear of every single item. But perfection is not what I was aiming for! I simply wanted to gather some real data to get a better sense of how my closet was performing and I achieved just that. If it’s easy to care for I wear it more! My most worn tops were all excellent layering pieces, which is essential for the variable weather out west. My most reached for pants were all about comfort, practicality and versatility. I tend to get cold easily, so there are a lot of jackets on this list. Outerwear remains a well used category in my closet! While the majority of the most worn pieces were ones that I’d brought with me, several of my new additions made the list. I think that shows that the new items were well-chosen! Not shopping for most of March and April really helped me identify items that were needed. Some of my favourite ‘special’ pieces like a wrap top and a couple of new items didn’t make the list but that’s ok! They’re still earning their keep in my mind. I was surprised by how many pieces I actually used. Almost 70 seems like a lot, and it is, but with how much the weather changed from the start of our stay (parkas and boots) to the end (tanks and skirts) it’s not as outrageous as the number might seem. The colour palette features a lot of black with pops of white, classic pattern and earthy neutrals. My love for natural fibres is going stronger than ever! Least worn clothing: I just don’t reach for dresses in late winter and early spring. Yet, since then I’ve worn almost every dress in my closet! I was also surprised that my burgundy cashmere only got worn once the whole time. Least worn shoes: For some reason I didn’t wear my MNZ Sophie sandals much but I think that will change now that it’s summertime. 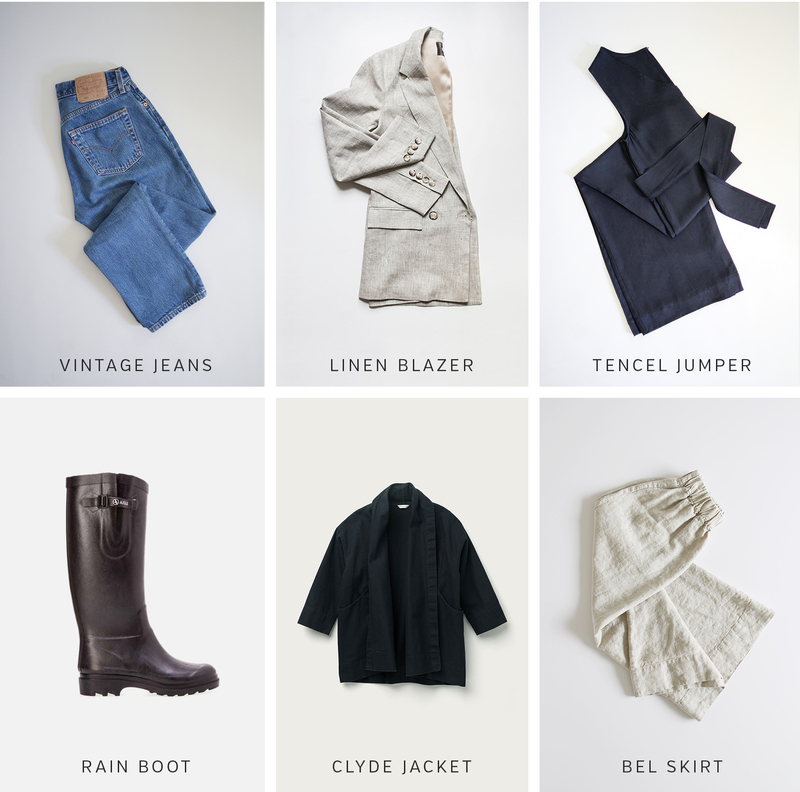 Reviewing the list really encourages me to wear more of my closet. It will take me quite awhile to get to 30 wears on most items. And that’s ok! If I don’t love how something fits, I don’t wear it! The items on my clothes rack get chosen more often than those in a drawer or packing cube. It’s all about visibility for me! I would have loved a classic fleece sweater/jacket (like this) and an ankle boot that’s somewhere in between a rain boot and a hiking boot (like this). I think I’ll consider adding those this Fall. My closet is working very well! There were a lot of pieces that tied in terms of wear count or were almost on my most worn list. To me this means I’m wearing a lot of my closet, which in turn means it’s highly versatile and appropriate for my lifestyle. I was also happy to see that there were not many items that went unused. Will I continue to keep a wear count list? YEP! I fell off the list making wagon during a busy month of June but I’ve started back up as of July 1st. Well that officially sums up my West Coast Wear Count! 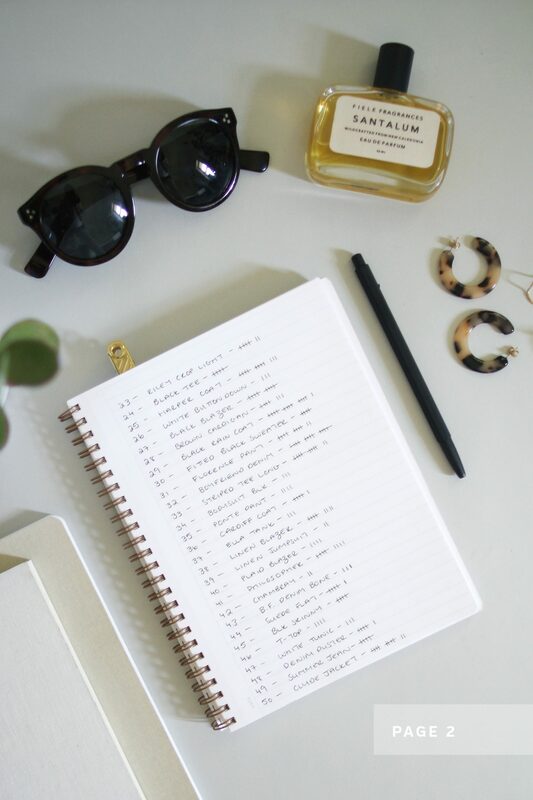 HAVE YOU BEEN KEEPING A LIST? IF SO, WHAT HAVE YOU LEARNED? WOULD YOU BE INTERESTED IF I SHARED MY MONTHLY WEAR COUNTS GOING FORWARD? I’LL BE BACK NEXT WEEK WITH SOME TIPS FOR SUN CARE + MY ANTIBES PACKING LIST! This post is not sponsored or produced in partnership with any of the aforementioned brands but it contains affiliate links. When you shop using the links above I may make a small portion of the sale. Thanks for supporting the brands that support Style Bee. I’m now preparing my most recent wardrobe spreadsheet recap (here’s the previous one: http://unarmarioverde.es/3-months-spreadsheet/), but since I started tracking my wears in 2016 the best take-away always has been the power of real data vs. the ‘I wear this a lot’ falacy. We all have such capacity to trick ourselves that I do not believe these impressions. I’ve observed that people are in general able to know if they have worn something in last year or so but when it comes to 20 wears or 30 wears we are clueless and present the desired as reality. And these overestimations then fuel the wish for new things and overestimation of the usefulness of some other garments that should have been let go a long time ago. Tracking – as you mentioned – make us very aware of how long reaching those number goals actually take, even out of a smallish wardrobe. The spreadsheet has no wishful thinking! It’s actually time for another quarterly roundup so thanks for the reminder to write up that post! I definitely had the same insight you did that certain items still earn a place in my closet even if I don’t wear them all the time. And then, of course, there are pieces that are complete workhorses. It’s nice to have the options! 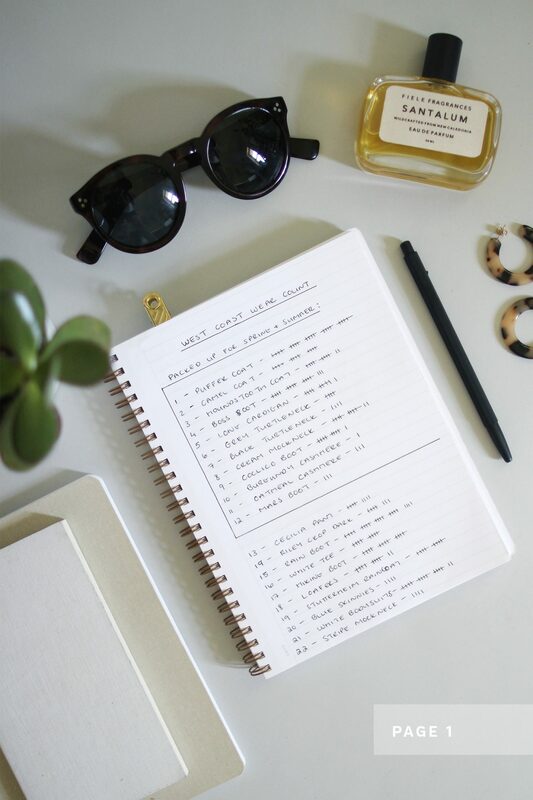 Hi, I’ve been tracking my items for over 7 years now – even before the whole sustainable fashion thing happened. Initially I started keeping track because I always felt like I was wearing the same thing over and over again and always longed for new items. But what I learned almost immediately, is that even if it feels I’ve been wearing something a lot, it’s not. The items I did get a good amount of wear out, were items I found ‘boring’. Over these past years, it did teach me a lot over my own style and quality of fashion. I learned that cheap fashion (like Primark) rarely stands the test of time and usually ends up way more expensive in terms of cpw. 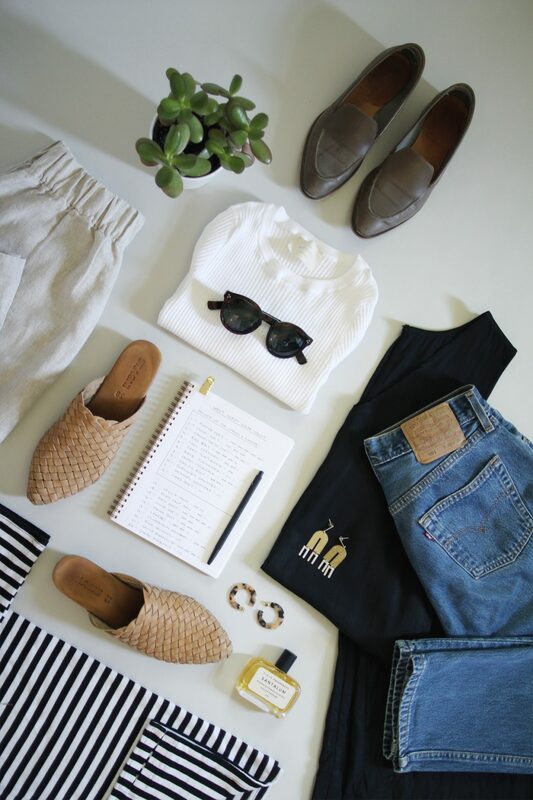 Investing in high quality (and sustainable) brands and pieces saves you A LOT in the long run. And since I’ve been doing this for such a long time, I also learned that there are years you don’t like an item anymore and would consider parting with it, but than after a couple of seasons you rediscover the beauty of it and it becomes a wardrobe hero again. I’ve been keeping track in a simple spreadsheet I created, updating it daily and per month / year. 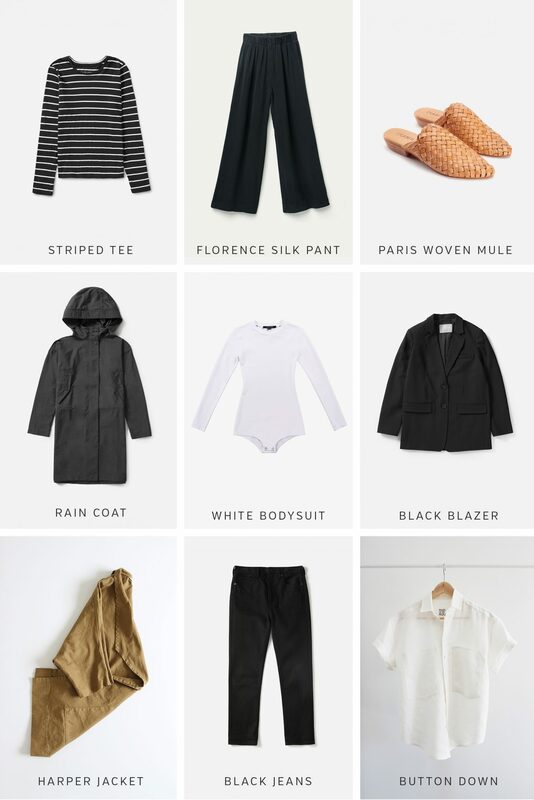 It helps me to oversee my wardrobe and everytime I want something new or feel like I’m in a style rut, I put some filters on that spreadsheet and make some conclusions on how the state of my wardrobe is atm. Seven years ago I wouldn’t have dared to share this with anyone, since people declared me crazy for it. But now I share my spreadsheet ideas with others and the feedback has been truly amazing. Hey Lee, thanks for the great post! Yes pliiiiz do continue with such posts, its so inspirational! Looking forward to the next one ? Thanks for this, Lee! I love hearing the wear count updates! I’ve been keeping a spreadsheet of what I wear for a month now and I’ve also found it really illuminating. 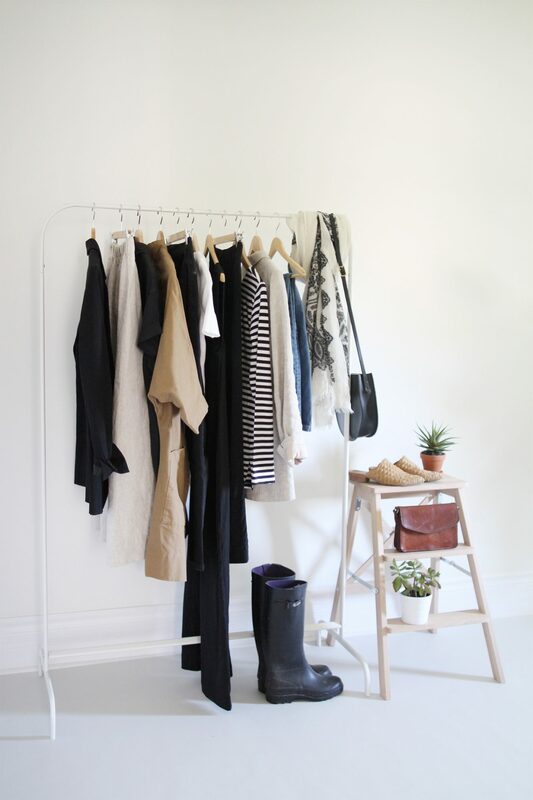 It will definitely help me to pare down my closet this year and has already guided new purchases. Tracking is a Many level helpful tool which I rather forgot to use in Spring. Intend to pick it up — everything you’ve done to date is so inspiring and I love your honest analysis. Helpful. Very insightful! I’m curious about your Stutterheim raincoat – which style did you go for, and what are your thoughts on it? I’m so pleased to have discovered The Bodysuit of Barcelona through you, I recently received the Simone bodysuit in rust from them and it is wonderful! I’m honestly thinking about ordering another one in white with long sleeves when they restock. Hi, I am thinking ordering one… how is the sizing? I like the Lana, also in rust! Hi Kate, I find the sizing is pretty standard but also quite forgiving since the fabric is very stretchy. I wear a M in every style I have and I’m usually a 2/4 in US sizing. I hope that helps! Thanks for the great post! I always find your blog inspirational. I’ve been living in Vancouver for years, but it is nice to see your take on what clothing works in this environment. I agree, living on the West-coast a fleece jacket is a must and the bloodstone boots are perfect. I did your workbook a few months ago and simplified my wardrobe by replacing items I didn’t wear with good quality ‘casual’ basics. I’m doing pretty good, my biggest challenge was upping my price point. Anyway, I’m looking forward to your summer 10×10 challenge. I’m packing for a three month trip and and I’m really struggling with how many items to carry. In the past keeping things light meant that I had to add items that weren’t ethically made or good quality just to get through. I’d love to pack enough that I don’t need to add anything while I’m away. I’ve been keeping track of my wear count for a few months now and it has been the single most effective tool in reducing the number of purchases I make. In reality I wear a limited number of items per season and much more than that is unnecessary. I love shopping but if I’m going to be committed to reducing waste and shopping ethically then I also have to wear something at least thirty times to make it worthwhile and help me feel less guilty about waste. This spring anything that didn’t get worn at least five times was moved to another closet where it waits to be sold or donated. Hi Alex, i love your commitment to more sustainable fashion! Im in the stage of starting it and readinng how people are approachig it is so inspirational. I loved shopping, really i was crazy about new clothes…but reading your comment “if i didnt wear it at least 5times” makes me open my eyes more and be more strict with my closet. Need to make a real clean out ?Wish you great packing! ? Thanks for your feedback and for sharing your experience with keeping a wear count Alex! So glad it’s been a useful tool for you too. 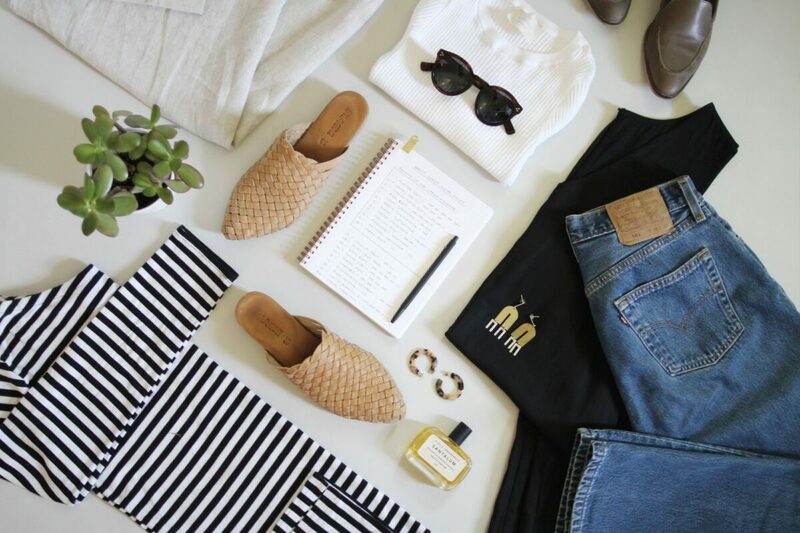 Good luck with your trip planning, I’m sure you’ll put together a great packing list! I’ve thought about doing this since it seems helpful to everyone who’s done it! I’d be interested in a monthly update. That’s great you’re wearing all your wardrobe and your new pieces are integrating well into your closet. I am feeling pretty good about my warmer weather closet too. Have a great weekend! Xo! Love your blog! Been following for over a year and you have changed the way I view fashion. Thanks for your thoughtful considerations. I too now have a wardrobe full of mostly ethical items I love. Keep inspiring! Thanks for sharing Lee! I found this a really interesting post. Later this year I’m moving to Europe from Australia for a year of study and am trying to figure out what to pack for the variable weather. I think this list count is a good helpful start for me, as you were dealing with changing weather too. Would love to see future clothing counts too!